I have seen some pretty amazing sights in my life in terms of landscape and architecture; my favourites to date being Mount Fuji, a magical vision of Japanese serenity and the gigantic Cristo Redentor atop Corcovado in Rio. But nothing could prepare me for my first glimpse of the Taj Mahal. The most amazing and unforgettable building in the world - to see it shrouded in early morning mist leaves you speechless - such an ethereal, unreal tribute to a loved one. It is hard to believe that the Taj Mahal is actually a mausoleum - built by the Mughal emperor Shah Jahan in memory of his beloved third wife Mumtaz Mahal. She must have been one amazing lady. And it leaves you wondering how you will be represented after departing from this world (no pressure Mr Jules). We visited the Taj as part of a long weekend starting in Gwalior (1.5 hour direct flight from Mumbai, and only a two hour drive from Agra, which is so much better than coming the other way from Delhi, over four hours drive away if you are on a short weekender). Gwalior itself was extremely interesting and so will write about it in my next post. We set off by car & driver from our hotel in Gwalior at six in the morning in the hope of arriving early enough in Agra to beat the crowds. But as can only happen to us, Saturday 27th October was not the most auspicious of days for tourists to visit the Taj Mahal. As it turns out, because it was Eid (one of the most important dates on the Muslim calendar) the authorities were allowing free access to anyone into site. And when I say anyone, I mean everyone! 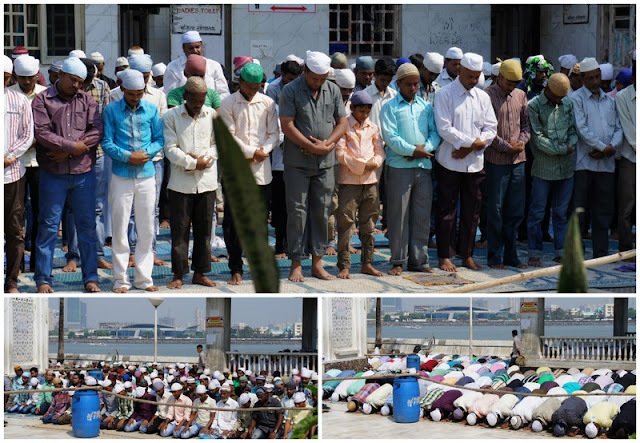 Already at 8am, there were tens of thousands of people streaming through the gates, mostly men dressed in white cotton salwar kameez and flat topped kufi head wear racing to get to prayers at the Taj Mahal Mosque (masjid) aside the main mausoleum. By the time we got through security checks and had walked through the Great Gate in front of the Taj, there were already too many people filling every space, bench, stairway and vantage point - making it impossible to get a good central view of the building. This was very disappointing for someone such as myself that likes to fill their blog with perfectly composed photos! But I was even more sorrowful that I was not going to get the famous 'Princess Di' pose in order. Inside was dark and crammed full of people trying to peer through the intricate marble fretwork at the pencil-box styled tombs. A man tried to con us out of a few rupees by shining his torch on the gemstone inlay (highlighting the translucence of the precious and semi-precious stonework) and by calling out loudly to create an echo - but we just walked off. After quickly viewing the side by side tombs and the impressive interior design, we went back outside. I was kind of glad we had not queued for a further hour bearing in mind the few minutes we had just spent indoors! We spent the next hour or so walking around the grounds and getting close up to the exterior decorations - every surface of the Taj Mahal contains intricate carvings, 28 types of semi-precious and precious stone inlays and Islamic calligraphy expressing passages from the Qu'ran. There is symmetry and architectural perfection everywhere you look. 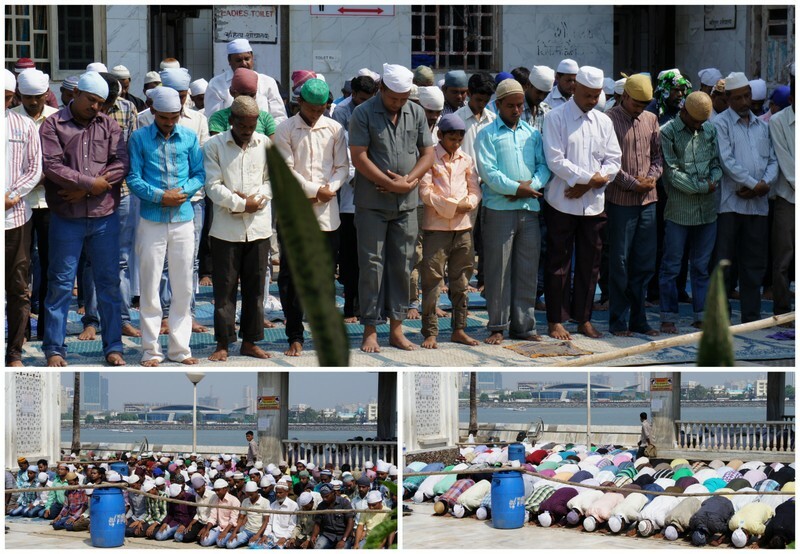 The sandstone mosques on the two sides are almost as impeccable as the main building itself and beyond is the river. The translucent marble used to build the Taj was brought from Makrana in Rajasthan and apparently 1,000 elephants were used to transport the materials and a further 1,000 workers used to contruct the buildings over around 22 years. Not a bad accomplishment I would say! After our close inspection of the Taj exterior, we meandered out and caught an electric taxi back up the lane to the car park (10 rupees against the 100 rupees we were conned out of for a rickshaw bicycle that we could barely fit our two butts in on the way down!). I was totally blown away by what I had seen in Agra and Mr Jules thought it wasn't bad either. Another side of the Taj - see the long queue of people waiting to see inside? Now times that by four! Going for a simple walk can be quite a challenge in Bombay. The pavements are broken, there are usually dogs and people (not in that order) randomly lying around, you are liable to disappear down open manholes, rickshaws often want to chase you up the sidewalk, people coming in the opposite direction will never move out of your way, and there is very little in the way of parks or foliage to enjoy whilst you are dodging all of the above. Taking a simple walk is really a basic human right and one of the things I miss most about our green and pleasant land (i.e. the UK). So yesterday (being a bank holiday), I persuaded Mr Jules to go for a stroll on the Skywalk. Now obviously this isn't exactly the same as a ramble across the Sussex Downs (although we did see a few cows), but it is as near as we are going to get to an uninterrupted walk in this crazy city. The Skywalk is an elevated walkway between Bandra Station and Bandra Kurla Complex, an expanding and modern office area to the east of Bandra. On the Skywalk, there are no beggars, no random animals or persons lying in your way, no trash, no spit (specifically banned! ), no hawkers and yesterday..not that many other people full stop. It is constructed of bright yellow struts with roofing to keep off the monsoon rains and even has the occasional bench and rubbish bin. I expect that during the week, workers in their office uniforms (the men in grey trousers with short sleeved shirts with their pens in their left hand pocket) stream across the Skywalk on their way to work, probably completely disregarding the chaos that co-exists beneath them. "Do Not Litter, Keep Your Skywalk Clean"
Why can't they apply this to the rest of Bombay? From the elevated position of the Skywalk it is literally possible to pass though all levels of life and livelihood (you will see what I mean from the photos below). You start by entering up the stairs at Bandra station and passing through the station itself - a pretty hectic place with bodies coming at you from all directions. Straight away, you find yourself right over some disused train tracks, lined on all sides with slum buildings. You have never seen such filth nor such a bad example of rubbish dumping in your life! During my four months in Bombay I have seen more rubbish than your average Englishman will see in his whole lifetime - but this still left me pretty shocked (not to mention disgusted). Then you see the children in amongst the squalor along with the crows and the dogs and you are left wondering what you can do about it (nothing of course). You carry on walking for a bit, peering over the tops of the two and three tier slum buildings which are about at eye-level...the corrugated and plastic sheeted roofs, the multitude of satellite dishes (never ceasing to amaze me), the women hanging out of doorways at the tops of ladders, the walls of their little homes seemingly inadequately nailed together. Everything is ramshackle and crooked and looks like it should fall down at any minute. More rubbish, more children playing. Then you see the huge pipes carrying water down from Powai lake into the city and again, more children playing in the small ponds that have formed in between them, sharing space with goats and cows. They may not be able to eat or dress properly...but at least they can watch Man U.
I try not to harp on about this side of the city as I intend to always show Bombay in a positive light - but then again it would be unrealistic to do so. Bombay is plain filthy. Bombay has naked, diseased, malnourished kids roaming free in amongst the squalor. It is all very plain to see from the Skywalk, nothing is hidden. Then you turn the corner of the Skywalk and you immediately start to see changes in the 'scenery'. There is a large patch of land next to a narrow canal where farmland is being cultivated. It seems to be nicely fertile - there are even egrets sticking their heads out of the vegetation. No-one is occupying it and it is virtually naked of rubbish - a bit further down is a tiny shanty - the 'farmer's' home I assume. Then you turn another corner and you start to see properly built buildings. All offices. The first one you notice is the Slum Rehabilitation Authority. "Nice offices" I think to myself. Something not quite right about that. Then you see the manicured lawns of Indian Oil with a tall, white, nicely maintained building behind. As you go on, there are more and more 'nice' buildings. I also think to myself how quickly we have gone from the virtual 'hell' of the slums to the 'heaven' of high-tech architecture. Literally in the space of ten minutes. After a quarter of an hour or so we come back down to earth at Bandra Kurla. We walk a little further up the finely tarmacked road with its perfect sidewalk until we reach Le Pain De Quotidien and decide to go in for Earl Grey Tea and pastries. Ummmm....now this really is heaven. The child in blue...about six years old, playing fishing in the pond that has formed between two water pipes. from a slum themselves, instead of from these nice AC offices! The fabulous roads, manicured hedges and barely used pavements of Bandra Kurla Complex. Pani Puri is possibly the most famous of Mumbai's street foods and Soam is my new favourite place for eating it - safely. Pani Puri (otherwise known as golgappa in Northern India) varies from street stall to restaurant to cafe but generally consists of the Puri, a round, hollow, fried crispy semolina pastry, filled with a mixture of minted spiced water ('Pani'), tamarind chutney, potato, onion and chickpeas/yellow peas and sprouts. It is small enough to fit completely into your mouth. They are so moreish that you end up eating one after the other until you're fit to burst. In a restaurant, all the components will be served separately and you build your own. Firstly by gently making a hole in the Puri with your finger, and then filling it up with each of the ingredients in turn, finally spooning the minty chilled water over the filled pastry. The Puri is pretty fragile, I normally end up breaking it before I've completed the process with the result of everything landing on my chin rather than in my mouth. This is definitely another Indian gastronomic artform! Note, due to water being one of the ingredients, us Westerners normally stick to eating this at places where Bisleri or other bottled water is used - it is NOT advisable to brave this delicacy at an unrecognised street stall! Hence why I recommend Soam as a good place to get stuck into Pani Puri. Soam is a mostly Gujurati pure vegetarian restaurant in South Mumbai near Chowpatty Beach. There are also elements of Rajasthani Cuisine on the menu. I am not expert enough to tell you whether the cooking is up to exacting Indian standards but I have had two very nice dining out experiences there. Inside the restaurant is modern and clean and Soam is always busy. Sometimes you may have to wait to be seated. The service is excellent and the manager tries to take personal care of diners by explaining how to eat various street foods (including Pani Puri) to novices like me. I have also tried the Farsan Platter (snacks) which included tiny samosas stuffed with paneer and methi leaves (fenugreek) and dhokla (a soft bread-like food made with gram flour) and I have tried the delicious Sev Puri, another popular Mumbai Street food. Sev Puri consists of crispy panis or papads, topped with finely chopped potatoes, onions and topped with chutneys and the sev - a crisp vermicelli made out of gram flour. 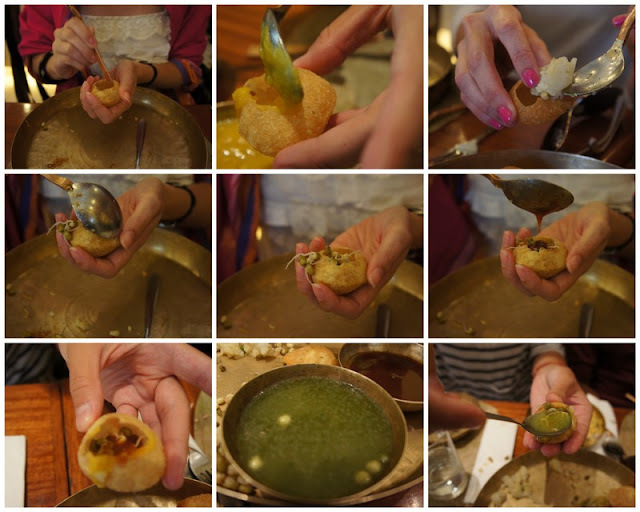 This is what gives the Sevi Puri its lovely crunch and again, you should be able to fit one piece in your mouth. (Errr not always succesful!). The time before last, we also had lovely soft and light masala dosas - large potato pancakes filled with a spicy potato mixture. Surely the next most popular street food in Mumbai! Enormous Mysore Masala Dosa - prior to being demolished, a perfect triangular envelope. Sambar and coconut chutney in the background- these are the usual accompaniments to Dosas. Most of the items are 100-200 rupees - a meal for two or three with lassis or sweet lime sodas comes in at around 6-700 rupees. With thanks to the various hand models used in this blog! A Finnish friend recently told me that it was possible to buy good houmous (hummus) at a cafe in the shopping centre at the Grand Hyatt Hotel in Santacruz. I think it is possibly a crazy but normal expat activity to hunt down singular food items at the weekend when one is feeling the need for something relatively bland (or just European). So please don't think us odd for driving 30 minutes just to get some houmous or for going to a hotel complex to find it! Also I wanted to check out the Mumbai branch of Bhandej clothes designs that I had discovered in Ahmedabad - but I didn't tell Mr Jules this. Happily, we succeeded in finding the houmous (which they freshly made for us!) as well as steak & onion pies in puff pastry and sausage rolls (oh HEAVEN! ), together with some Thai green curry paste actually manufactured in Thailand (the packets you normally get locally are made in India and bear no resemblance whatsoever to the real stuff), almond croissants (does there seem to be a bit of a puff pastry theme going on here?) and a tin of John West Tuna. Result. This cafe is really an outpost for posh expat foods which can be ordered in and picked up at your leisure. It's OK to be 'curried out' isn't it? Better than that, we discovered just before the entrance to the Grand Hyatt, a stretch of road with a long string of plant sellers on it. A sort of al-fresco gardening centre retailing a wide range of good quality outdoor and indoor plants. Back 'home' in the UK Mr Jules is a semi-enthusiastic gardener (I'd say a fair-weather one) so he was keen to inspect what was on offer, with a view to making some purchases for our sitting room balcony. So we got out of the car and walked along the long rows of foliage until we saw something that took our fancy. Unfortunately I do not know the names of many of the plants but there was a huge variety of evergreen and deciduous greenery, flowers and shrubs, some with eye popping colours, some tall and some small. If you pick out what you want, the shopkeepers will eagerly sell you a plastic pot for 50-100 rupees (depending on the size) and then pot it for you using soil from a nearby pile. Very efficient really, you wouldn't get that service in the UK! We chose a couple of spiky leafed plants and we were going to add a few more similar sized ones until a large and fabulous bougainvillea caught my eye. Such a beautiful deep pink colour! I negotiated a price of 750 rupees including the pot and soil. OK, he stated the price and we didn't argue - £9 for this lovely tree really wasn't much. Only when it was too late and money had changed hands did we realise that we possibly would not get the tree into our regular sized saloon car. After some heaving and moving of car seats and shedding only a few of its leaves, we somehow managed to squeeze our new bougainvillea in behind the front passenger seat. It took four men though - Mr Jules, our driver and two stallholders. We drove home with Mr Jules in the passenger seat and the tree tickling his neck from behind. Our lovely bougainvillea is now in place on the balcony - all we have to do is try and keep it alive. I recommend that any Mumbai resident go along and have a look at this 'garden centre', even if it's just to see something green. The plants are a fraction of their equivalent price abroad and in a city where outside space is at a premium, it's nice to spruce up the ones that we do have. Just remember to allow for the transport of very tall or wide plants! The Gourmet Store, 7:00am - 9:00pm, The Grand Hyatt Plaza, access from the Lobby level. Al-fresco garden centre at CST Road (Hans Bhugra Marg) off the Western Express Highway on the way to the Grand Hyatt Santacruz. PS Bhandej did not receive any custom from me this time.